GORDONVILLE – We all live with regret, and sometimes it’s the little moments – the seemingly innocuous choices to put the left foot in front of the right – that rise to the top of the list as the calendar unmercifully flips from year to year. Let us board a time machine and travel back to the summer of 1986. My father had rented a house in the mountainous woods of Vermont for the summer. After taking advantage of the freedom of no parental supervision for weeks on end, my sister and I went there for a week in late August. It was a pretty cool place, with the feel of an old-fashioned log cabin but modern amenities that included a Jacuzzi the size of a small swimming pool. I remember being at a creative peak as a songwriter – and guitar player (something I have since given up) – and using the long car rides to plays at places like the campus of Williams College and shopping outlets as fodder for whatever deep thinking a 21-year can have (brains don’t fully develop until the ages of 24 and 30). And now, for that moment of regret. It should have been when I lost my temper when everyone in the car – father, step-mother and sister – mocked Suzanne Vega’s first “tape” after 10 seconds into the first song, but I’m still proud that I defended Suzanne’s honor (even though she rightfully looked at me like a stalker when I was first in line and babbling like an idiot when we saw her at the Sellersville Theater a few years back). No, it came when my sister and I went to a concert in whatever nearby sign of civilization that served as the pseudo-downtown area. The featured act was Woodstock hero Richie Havens. We walked into what was basically a glorified barn with a bunch of benches laid out in front of a stage. While the latent hippie types malingered, we went straight to the front row. I briefly noticed a few homemade cassette tapes that had the name “Rod MacDonald” written on them in magic marker, but gave it no real thought — other than my own musical endeavor, The Last Wave, was not much different (except we weren’t warming up for Richie Havens and never made it out of my basement, except to record some songs in my guitar teacher’s basement). MacDonald took the stage with an acoustic guitar and rolled through a set of well-written songs that he set up with poignant and witty stories. I had him pegged as either a 1960s has-been or wannabe who, through bad luck, had been nothing more than a regional New England act. Actually, as benches began to slow fill with earth-shoe-wearing refugees from New York City and Boston, there seemed to be some measure of familiarity with the song – “Stop The War” – in the audience of less than 200. As a songwriter type myself, I listened intently and was spellbound by the lyrics. I was expecting a leftover Vietnam-era song, but it was one of those songs that can fit like a hand in a glove at any place in time. After MacDonald was done playing, I ventured to the back of the “theater” to locate a bathroom and maybe grab a snack. I noticed the tapes still there, and figured that I would wait until after the Richie Havens performance and pick one up. Havens then played, and I was enthralled at his unique guitar style that I have later learned was due to him being self-taught. He ran through a bunch of songs – including plenty written by Bob Dylan, who I was all about that summer (even more than Bruce Springsteen) – and brought the crowd into a bit of a frenzy with “Freedom,” the song he rocked a much larger throng with at Woodstock. The show had ended and we exited into my father’s waiting car out front. It didn’t hit me until halfway home that I never picked up MacDonald’s tape. Maybe it was because I was riding a buzz that both Havens and his backup guitar player acknowledged me with winks and nods for appreciating the performance with such intensity. Maybe it was because my sister wasn’t feeling well (or at least that it what she said). Or maybe it was that underdeveloped brain of mine. The following morning, back in town, MacDonald was in the same diner eating breakfast with his manager. The G2 of today would have approached, heaped platitudes upon him, told him I was an aspiring songwriter myself and asked about buying a tape. But I was more timid back then. It left me with regret. I thought I had read somewhere that MacDonald had died, but I must’ve Googled the wrong dude. He is not only alive, but his career has gone well from those days of selling homemade tapes. 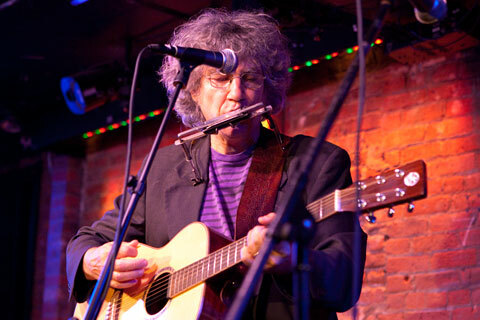 He was not really the 1960s leftover I imagined, as he was just building his reputation in the 1980s as key cog in the folk revival in Greenwich Village. And his under-the-radar music has come a long way, in terms of availability. Just about all of his songs – many of which have been covered by a plethora of quality acts – are available on iTunes. First verse about a general. Second verse about a stock brocker. A lot of people are busy making New Year’s resolutions, and I usually do the same. A few years back, I decided to make them more inward than outward (losing weight, exercise, etc.). In 20I1, I tried letting things slide. Come 2012, I tried not caring what other people think about me. In 2013, there was the old attempt at not worrying about what is out of my control. Well, in 2014, I’m going to raise the bar. And really, when I look in the mirror at the well-meaning but flawed being glaring back, it’s not a laughing matter. I’m going to stop the war. So that I don’t have to fight with anyone else. I may have forgotten to buy your tape back when my brain was not fully developed, but I never forgot your words. This entry was posted in Music, Slice of Life on January 2, 2014 by gordonglantz.